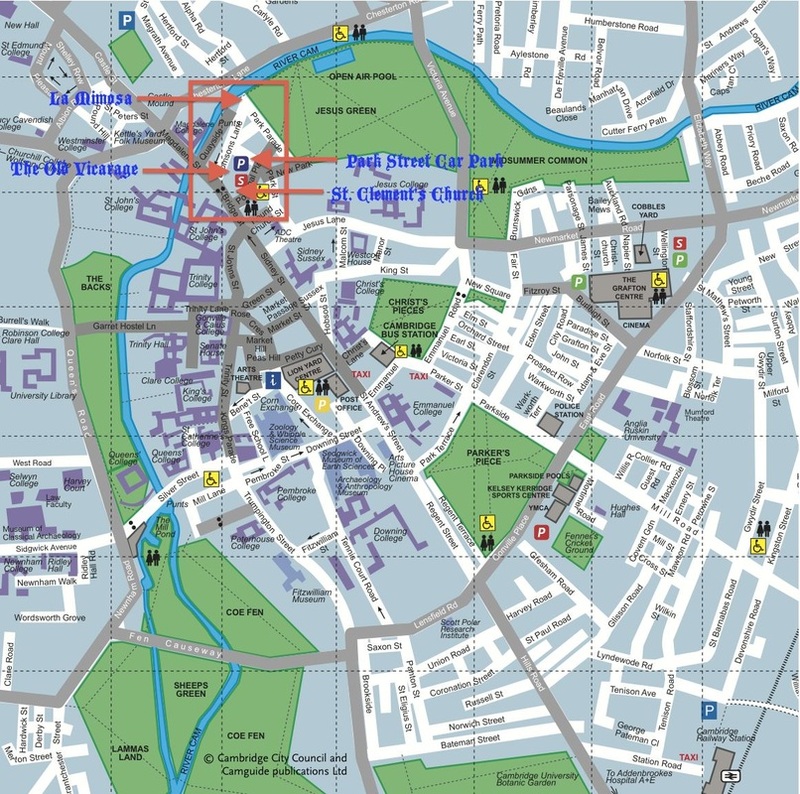 Cambridge is located in the heart of East Anglia, Cambridge is easily accessable by air, road and rail. From the South & from London, Cambridge is a short trip up the M11 motorway. From the north, the A1 and M1 link to the A14 dual carriageway straight to the city, and from the east and west, the A14 again takes you to Cambridge. There are signs on the city-bounch approaches to each of the Park & Ride sites, where you can park your car for free and take the bus into the center. If you choose to park in the city center expect to pay £1 per hour after 17:00. There are additional signs located across the city center which indicate the direction to each car park and will also tell you the number of spaces available. The Park Street car park is the closest and a three minute leisurely walk from both St. Clement's Church and La Mimosa, where the reception will be held. Cambridge is within easy reach of London Heathrow, London Gatwick & Birmingham International Airports. The National Express Bus has a service from all these airport into Cambridge. They are a convenient way to travel into Cambridge and we highly recommend it for ease and the cost is approximately £25 each way. Private cars are available, yet expensive, so expect to pay around £130 from London Heath Row and £180 from Gatwick. London Stansted is the nearest large airport to Cambridge, located just 30 miles to the South of the city, with easy access by train, coach, or car on the M11. Both easyJet and Ryanair fly from Stansted. By Bus you can take the National Express from most major towns and cities throughout the U.K.
By train there is fast and frequent rail service from London King’s Cross & London Liverpool Street stations through to Cambridge. There are excellent connections from Scotland & the North via Peterborough, and regional services from Birmingham & the Midlands, East Anglia & the Northwest. The railway station is about 15 minutes walk from the city centre and there are always plenty of taxis and buses available . The taxi stand is located on your right when you exit the station and you should expect to pay around £10 to get to the city center. Likewise, you can get the bus on the Citi 1, Citi 3 or Citi 7, which are all fast and frequent.